The city of Jerusalem is sacred to a number of religious traditions, including the Abrahamic religions Judaism, Christianity, and Islam, which consider it a holy city. Some of the most sacred places for each of these religions are found in Jerusalem and the one shared between all three is the Temple Mount. Jerusalem has been the holiest city in Judaism and the ancestral and spiritual homeland of the Jewish people since the 10th century BCE. During classical antiquity, Jerusalem was considered the center of the world, where God resided. The city of Jerusalem is given special status in Jewish religious law. In particular, Jews outside Jerusalem pray facing its direction, and the maaser sheni, revai and First Fruits must be eaten in Jerusalem. Any expansion of the city for these purposes must be approved by the Sanhedrin. Also, when the Temple in Jerusalem was standing, Jerusalem observed special laws regarding the Four Species on Sukkot, and the Shofar on Rosh Hashanah. Jerusalem has long been embedded into Jewish religious consciousness. Jews have studied and personalized the struggle by King David to capture Jerusalem and his desire to build the Jewish temple there, as described in the Book of Samuel and the Book of Psalms. Many of King David's yearnings about Jerusalem have been adapted into popular prayers and songs. Jerusalem appears in the Tanakh (Hebrew Bible) 669 times and Zion (which usually means Jerusalem, sometimes the Land of Israel) appears 154 times. The first section, the Torah, only mentions Moriah, the mountain range believed to be the location of the binding of Isaac and the Temple Mount in Jerusalem, and in later parts of the Tanakh the city is written explicitly. The Tanakh (or Old Testament), is a text sacred to both Judaism and Christianity. In Judaism it is considered the Written Law, the basis for the Oral Law (Mishnah, Talmud and Shulkhan Arukh) studied, practiced and treasured by Jews and Judaism for three millennia. The Talmud elaborates in great depth the Jewish connection with the city. According to the Hebrew Bible, the First Temple, at the site known as the Temple Mount today, was built by King Solomon and finished in 950 BC, and Mount Moriah is where Abraham almost sacrificed his son and talked to God. When the Babylonians captured the city in 580 BC, they destroyed the temple and sent the Jews into exile. That is, all worshiping was practiced in the temple and only the temple. From the Babylonian capture, Judaism was codified. The Tanakh (Old Testament) laid the foundation for both Christianity and Islam. In Christian tradition, Jerusalem's place in the life of Jesus gives it great importance, in addition to its place in the Old Testament. Jerusalem is the place where Jesus was brought as a child, to be "presented" at the Temple (Luke 2:22) and to attend festivals (Luke 2:41). According to the Gospels, Jesus preached and healed in Jerusalem, especially in the Temple courts. There is also an account of Jesus' "cleansing" of the Temple, chasing various traders out of the sacred precincts (Mark 11:15). At the end of each of the Gospels, there are accounts of Jesus' Last Supper in an "upper room" in Jerusalem, his arrest in Gethsemane, his trial, his crucifixion at Golgotha, his burial nearby and his resurrection and ascension. The earliest Christians were outcast and used the fish symbol to recognize one another to avoid being killed or reprimanded for being Christian by Roman rule. Christianity became more popular over time, but made a huge expansion when the Roman Emperor Constantine claimed Christianity as his religion and thus the religion of the Roman Empire. Jerusalem is mostly important to Christianity because that is where Jesus Christ was brought to occasionally as a child, preached to the poor in his adult life, crucified in the end of his life, and resurrected by God. The Church of the Holy Sepulchre is said to have been built over the location where Jesus was crucified and where the tomb was buried. In Christianity, the Jewish connection with the city is considered as the account of God's relationship with His chosen people—the original covenant—and the essential prelude to the events narrated in the New Testament, including both universal commandments (e.g. the Ten Commandments) and obsolete or Judaism-specific ones. In medieval times, Christians thought Jerusalem was the center of the world (Latin: umbilicus mundi, Greek: Omphalos), and was so represented in the so-called T and O maps. Byzantine hymns speak of the Cross being "planted in the center of the earth," and the imagery is tied to the concept of the Death and resurrection of Jesus being for the benefit of all mankind. Medieval maps of Europe usually placed the east ("orient")—Jerusalem—at the top, and this arrangement led to the use of the term "to orient" to mean to align a map with actual compass directions. Jerusalem is considered a sacred site in Islamic tradition, along with Mecca and Medina. Islamic tradition holds that previous prophets were associated with the city, and that the Islamic prophet Muhammad visited the city on a nocturnal journey (Isra and Mi'raj). Due to such significance, it was the first Qibla (direction of prayer) for Muslims and the prophet Muhammad designated the Al-Aqsa for pilgrimage. Born in 570 AD, Muhammad is believed by Muslims to be a messenger for God. He reformed the perspective that God should be worshiped through prayer, reciting God's messages and only worshiping God. Muhammad declared himself to be the last prophet of the Judaic-Christian Religions and he founded a third Abrahamic religion: Islam. The Dome of the Rock is an Islamic sacred shrine in Jerusalem, built on the Temple Mount. It is believed this is where Muhammad ascended into heaven and was given the second pillar of Islam, to pray five times a day, from Allah, which is still used today. The Dome of the Rock is influenced by Byzantine Christian architecture, being of a Central Dome Plan. Muhammad is believed to have been taken by the miraculous steed Buraq to visit Jerusalem, where he prayed, and then to visit heaven, in a single night in the year 610. Jerusalem is not directly mentioned by name in the Qur'an, nor is it mentioned by its Arabic translation (Al Quds). However, the Qur'anic verse (17:1) is interpreted by Islamic tafsirs (commentaries) as referring to this journey, with the term "the farthest Mosque" (al-masjid al-Aqsa) referring to the Noble Sanctuary in Jerusalem, where the mosque stands. There he meets other prophets (in particular, Abraham, Moses, and Jesus). Narrated Jabir bin 'Abdullah: "Then he heard Allah's Apostle saying, "When the people of Quraish did not believe me (i.e. the story of my Night Journey), I stood up in Al-Hijr and Allah displayed Jerusalem in front of me, and I began describing Jerusalem to them while I was looking at it." Sahih Bukhari: Volume 5, Book 58, Number 226. Part of Jerusalem's significance and holiness to Muslims derives from its strong association with Abraham, David, Solomon, and Jesus. They are all regarded as Prophets of Islam and their stories are mentioned in the Qur'an. After Muhammad, many of his Companions lived in Jerusalem, and upon their death they were buried there. In Mandaeism (an ancient Gnostic-like non-Christian religion, once significant in numbers but now a small group found primarily in parts of southern Iran and Iraq), Jerusalem is considered a city of wickedness, dedicated to the god of Judaism, whom they call Adunay (Adonai) or Yurba (possibly YHWH) and consider to be an evil spirit. According to Sidra d-Yahia 54, Jerusalem is "the stronghold that Adunay built ... [he] brought to it falsehood in plenty, and it meant persecution against my tarmidia (Manda d-Hiia's disciples)." In the Ginza Rba (15.11), it is said to have come into being as a result of the incestuous union of the seven planets with their evil mother Ruha d-Qudsha, meaning Holy Spirit, who "left lewdness, perversion, and fornication in it. They said: 'Whoever lives in the city of Jerusalem will not mention the name of God.'" (Elsewhere, however, it more prosaically says the city was built by Solomon.) However, Yahya (John the Baptist), an important figure in the religion, is said to have been born there. "The Jewish people are inextricably bound to the city of Jerusalem. No other city has played such a dominant role in the history, politics, culture, religion, national life and consciousness of a people as has Jerusalem in the life of Jewry and Judaism. Since King David established the city as the capital of the Jewish state c. 1000 BCE, it has served as the symbol and most profound expression of the Jewish people's identity as a nation." Basic Facts you should know: Jerusalem Archived 2013-01-04 at the Wayback Machine, Anti-Defamation League, 2007. Accessed March 28, 2007. ^ Korb, Scott. Life in Year One. New York: Riverhead books, 2010. print, 155. ISBN 978-1-59448-899-3. ^ Lacey, Ian. "Judaism as a Religious Tradition - Israel & Judaism Studies" Israel and Judaism Studies. 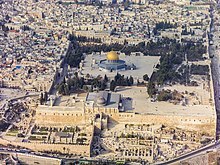 ^ "Temple Mount, The," GoJerusalem.com. ^ "Christian Fish Symbol, The." Religion Facts. ^ "Holy Sepulchre." Encyclopædia Britannica. Encyclopædia Britannica Online Academic Edition. ^ "Muhammad." Encyclopædia Britannica. Encyclopædia Britannica Online Academic Edition. ^ "Islamic world." Encyclopædia Britannica. Encyclopædia Britannica Online Academic Edition. ^ "Dome of the Rock." Encyclopædia Britannica. Encyclopædia Britannica Online Academic Edition. ^ Brooke Olson Vuckovic. Heavenly journeys, earthly concerns (2004). Routledge. ^ Significance of Jerusalem to Jews and Christians Archived 2010-06-02 at the Wayback Machine, IslamOnline, July 10, 2002.